It has been very quiet on my blog--well over three months. I am touched that my readers still come by and read, even though I have been out of action for a while. 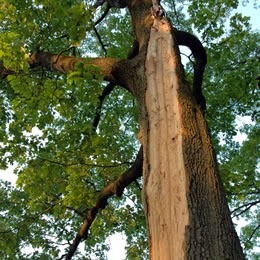 Let me ask you: Have you ever seen a tree that has been struck by lightning? It may be missing a branch, have burn marks and look as if it should not be standing. Yet it is. It is forever changed by its unintentional encounter with that jagged white-hot bolt. No tree searches for such a strike from the heavens; it's a risk every day it stands tall in a field and storms gather above it. It grows, produces seeds, watches the seasons change and yet, when the sky grows dark with iron-gray clouds, it stands: facing down yet another storm. Another year. Another risk of being struck. The tree embraces the risk: in a field where the soil and sun make it grow and prosper, is the same field where it can get hit. Life is no different. The same life that brings us joy is the same life that can strike us down. On August 2nd, my husband suffered a heart attack. We were watching a John Wayne movie on a Saturday night, and he said he had chest pains. He had just spent forty minutes on the treadmill. Last summer, he had had an aortic valve replaced. For a year, he had been the textbook patient: he exercised, lost weight, watched his diet and as a result, he felt good. I thought his pain was perhaps from over-exertion. He is 57 years old and sometimes overdoes the exercising. But that night, he said not only was his chest hurting, but also his back and left arm. He wanted to go to the ER--I opted for the urgent care, which is far closer. I figured the sooner he was under medical supervision, the better. We sped into urgent care, and sure enough, his heart was "all over the map"--to use the paramedic's phrase. The urgent care people had called the paramedics almost immediately, after administering nitro-glycerine. One of the paramedics walked out and told me that Clayton was loaded into the ambulance and with lights and sirens a-blazing, away they went. I followed to the ER and he was already being rushed into surgery, to have a stent put into place for a clogged artery. I waited and waited--hospital time is frustratingly slow. His cardiologist who "happened" to be in the ER that night (no coincidences exist in the Lord) came and found me in the waiting room. He outlined the surgery's progress and then I heard a dreadful word: "stroke." He had suffered a stroke when a piece of calcium deposit in that aortic valve was bumped into, broke away and went into his brain. I felt the color drain out of my face. He was now to be transferred into CICU. The enormity of the event was not yet evident--Clayton was awake and talking with the nurses. He then called a friend. Within 24 hours though, the stroke made its destruction known. Clay's right side went quiet. His speech slurred and he seemed to be fading away. I asked the neurologist how far down he would go--she said the next 24 hours would tell us the extent of the damage. The next day, he seemed even further hampered. He was trying to recite formulas from physics to show he was not mentally gone--he seemed to know something had gone wrong, but to what extent, was a mystery to us all. Finally, the neurologist said we were at the extent of the damage. She showed us the MRI, which showed a light gray jumble against a dark gray landscape. My husband's brain had been struck, if you will, by lightning. My brilliant husband--he has defended the 2nd Amendment with endless enthusiasm, even to having his work cited by the Supreme Court regarding the unconstitutionality of Washington DC's gun ban. He has written seven books, all concerned with history, whether about black demographics in the US, about his ancestor's role in the Civil War, to why guns are an integral part of the US. His last book changed directions: he wrote passionately about the changes in mental health laws in our country, which have directly contributed to an increase of mass public shootings. He embraced the risk: he has spoken out and has received much criticism about his positions, and yet he has stood tall, wanting this country to honor its Constitution and be more humane in its treatment of those who battle with mental illness. The same soil that nourished him, his passionate love of history, also put him at risk: working long hours at a 9-5 job, only to then to go and teach, write articles, do research, write books and fly hither and yon to speak and defend his positions. The lightning struck. The tall tree I call my husband was hit hard. He is now at home, after eight weeks in the hospital. He can speak and think clearly--to God be the glory. People who have left-brain events are usually bereft of these faculties. Clayton is left-handed so his brain seems to be working around that part of the stroke. But his right side is weak. He can walk now with a cane and sometimes on his own. His right arm is still quiet, and he finds that discouraging. He is eagerly awaiting more physical therapy for a full recovery. We are walking along a new road. We have been married 35 years in March, and this is one more challenge we will face together. I thank the Lord for His nourishing presence in this time, how He has worked through those around us. Our son and daughter have been wonderful--supporting us as they struggled with their own fears and suffering about their father. Our grandbabies have been wee rays of light, with lots of pictures and "I love you's" along the way. Our son-in-law has stood by wife as she came to visit the hospital and he came and joined us with love and concern. Extended family sent cards and emails. Our friends have come by and played chess, brought books and have offered prayers to our Father, Who has never left our side. This beloved tree was struck. But by God's mercy, it still stands.